Facing FRP lock in your Redmi 5A? Nowadays too many Redmi 5A users also facing the same issue with Redmi 5A after the update of MIUI 10, That’s why here we share with you a solution to Bypass FRP Xiaomi Redmi 5A-MIUI-10 very easily, follow this guide if you need a working great solution to reset FRP lock from your device even without using any computer, This is the latest method that we found while we try to Bypass Google FRP Redmi 5A MC13B. 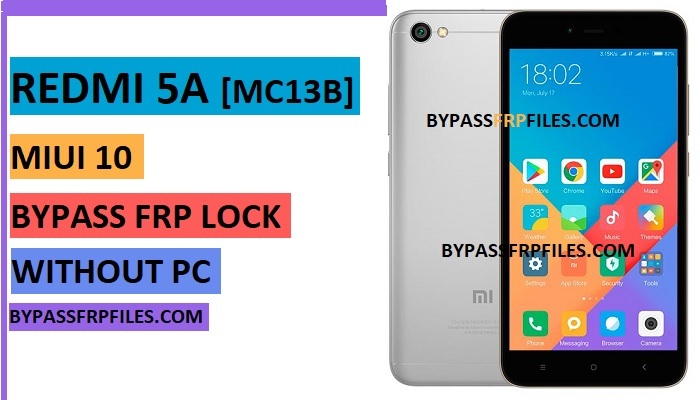 Note:- This method we tried to Bypass Redmi 5A MC13B FRP. FRP is (Factory Reset Protection) for our Latest Android devices, if you forget the Pattern, Password and fingerprint lock for this you have to hard reset your device by using keys, after you hard reset your device then you need to enter the previously synced Gmail ID to using your access your device home screen once again, then why we need to Bypass? its very simple answer if we forget the Gmail ID that we enter synced previously on our device, then you need to Bypass FRP Redmi 5A MC13B and use our device once again. -After that, “Choose Region” and select your region there and choose your language there. -Once your device connected to any “Wifi Network”, then check below you will see “Add Network” option there. -After that, tap on that “Add Network” option, than type anything there. -Then a text popup will appear “Cut/Copy/share icon” there, just tap on that “Share icon”. -Again a popup will appear, long tap on the “Gmail” app until you redirected to “Gmail” app settings. -Once you redirected to the “Gmail” settings menu, then check below you will get “Notifications” option there. -Then go down and tap on the “App Settings” option. -Now tap on the “3 dots” from the top right corner of your device screen. -After that, tap on the “help & Feedback” option there. -Then tap on the “search” icon and type “Voice” there. -Once you write “Voice” there, then you will get some suggetion select the “Get Started with Voice Access” there. -Just tap on the Play button, and check once the video will play then you will get “Clock” icon. -After that, you will get a “Browser” selection popup. select the “Mi Browser” from there. -Boom, Now you will access “Browser” successfully, download Redmi 5A FRP File to successfully Bypass Google FRP Redmi 5A MC13B. -Once you access the “Browser” on your device screen. -Then tap on the “search bar” of your device browser. -After that, type and search there “Bypass FRP Gadgetsdr“. -Now you will successfully access the “Bypass frp” page, download from there Redmi 5A FRP File. -Download the below following file to Bypass FRP Xiaomi Redmi 5A. -After that, tap on the “3” arrows from below, and then select “Manage Downloads”. -Once downloading finish, tap on the “Open” button from there. -Enable “Unknown Source” from that popup. Wow impressive, now you can successfully your device home screen but still frp is on, now follow the frp remove steps from below to successfully Bypass Google FRP Redmi 5A MC13B. -Once you access your device home screen, then go to “settings” from there. -Then tap on the “About Device” from there. -Then go back to the “Settings” main menu, and tap on the “Additional Settings” from there. -Now go down to the “Developer Option” from there. -After that, enable the “OEM Unlocking” option from there. -Then you will get another popup, tap on the “Enable” button from that popup to Bypass FRP Xiaomi Redmi 5A successfully. Make Sure-go back to the “Additional Options” and again go to the “Developer Option” to check OEM Option is enable or not. -Then once again go down below and enable the “USB Debugging” mode there. -Once Power On then setup your device. -Now check you have successfully Bypass Redmi 5A MC13B FRP. Thanks for visiting us, if you facing any problem with this Bypass Google FRP Redmi 5A MC13B (MIUI-10) Without PC, comment us below.